This is really really sad. Cameroon midfielder and International player, Patrick Ekeng is dead. He died after collapsing during a match in Romania. 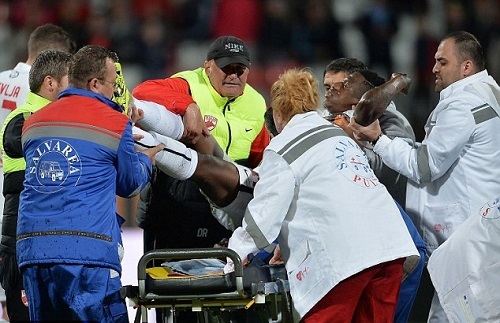 Cristian Pandrea, a spokesman for Floreasca Emeregency Hospital in Bucharest, said doctors tried for an hour to resuscitate the Dinamo Bucharest and Cameroon midfielder but failed. He said the cause of death is not yet known, but local media said the 26-year-old had a heart attack. 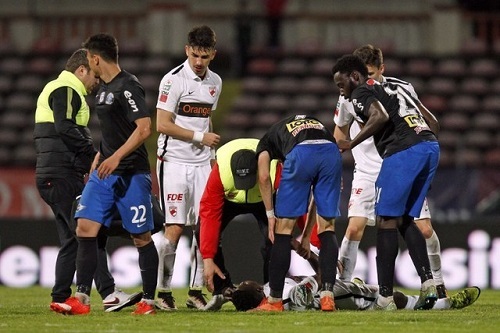 The match between Dinamo and Viitorul Constanta was tied at 3-3 and being broadcast live when Ekeng fell to the ground in the 69th minute, seven minutes after he went on as a substitute. He was immediately taken to hospital, where dozens of fans gathered outside. Players and staff could be seen crying as events unfolded, and some went with him to hospital. 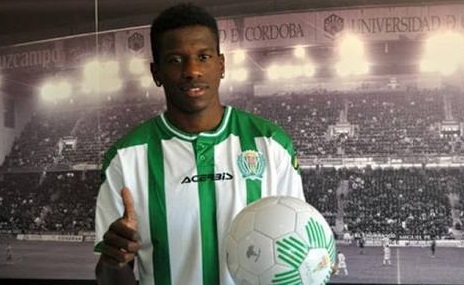 Ekeng played for Spanish club Cordoba, Swiss side Lausanne and French team Le Mans, before moving to Dinamo last year. He is survived by a wife and daughter who are in Paris. His wife is expected to arrive in Romania today.